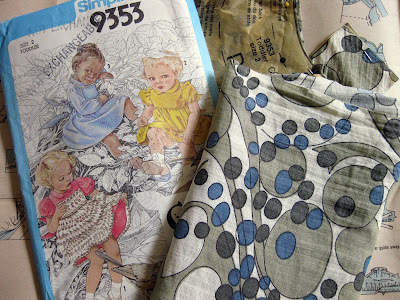 I love to collect vintage patterns, especially girl's party dresses. This was the perfect combo for my daughter's third birthday. The piping defined the seam lines and it tied with a bow in the back. I fought it and fought it and fought it - my daughter finally took interest in everything Disney, especially the Princesses. For her 3rd birthday, she wanted a Princess Party. My challenge was to not be the wicked witch but somehow meet her in the middle. We came up with a "Royal Tea Party" theme which included crowns, tea, cupcakes and I made her a dress that passed the "twirl test". 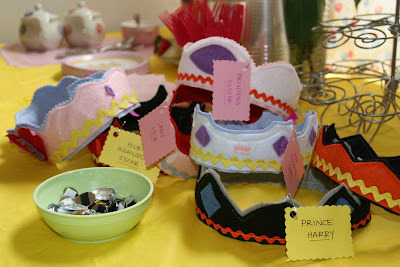 Instead of goodie-bags, I made a custom felt crown for each child. 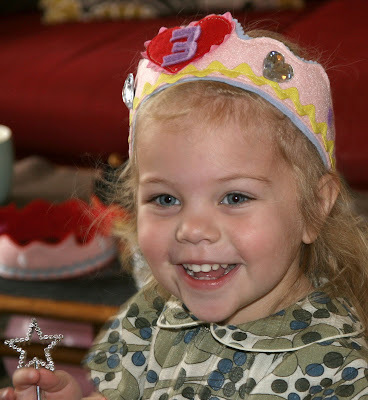 In addition, I had a bowl of jewels that were backed with Velcro so that they could customize their crown. 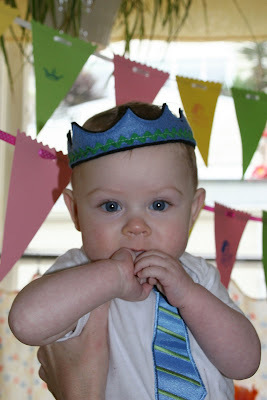 The crowns were fastened with a ribbon so that each guest could size them as needed. For decorations, I cut triangles from craft paper, trimmed the top edge with scallop scissors, punched 2 holes and then threaded the ribbon through. 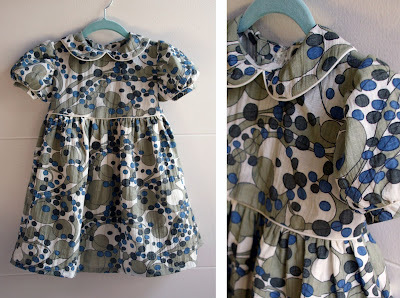 No sewing needed! 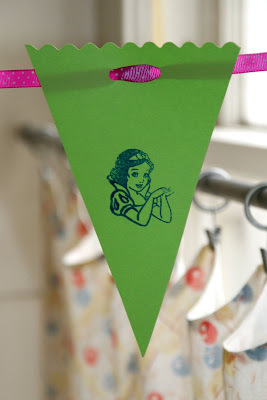 The princess element was the crown & Snow White images stamped on various triangles. The adults munched on tea cakes and scones displayed on a custom tiered dessert stand. Tea and juice boxes were served as beverages and everyone had a royal time! Throwing a tea party means having adequate serving supplies to display those dainty bits of food. 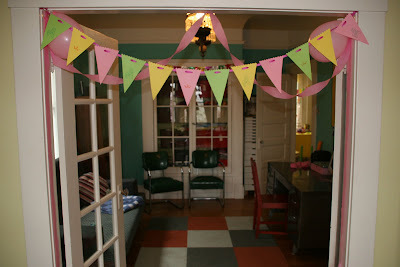 Knowing that I would probably not host another tea party until my daughter's next princess party, I opted to make my own. I collected 3 glass plates and 2 glass candleholders from the local thrift store. In under $10 I found just the right pieces. In order to frill it up, I used paper doilies on the backs of each plate as stencils. 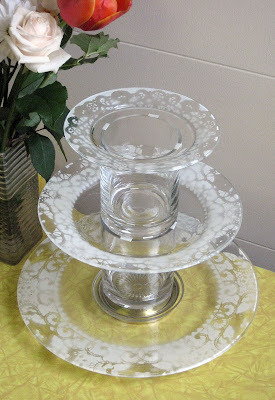 Use small bits of double-stick tape to hold the doilies in place. A large cardboard box makes an excellent contained area for spray painting. 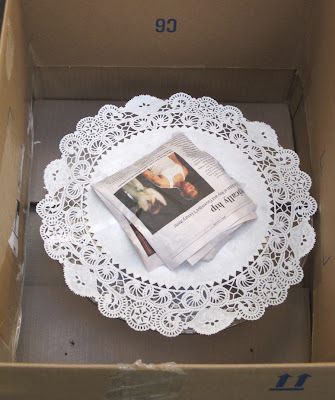 Lightly spray around the open areas of the doily being careful not to over-saturate the paint or it will run. When the paint dries, stack up the plates and candle holders. I used a heavy-duty double-stick padded tape between the layers so that nothing toppled when the guests pulled treats from the stand. 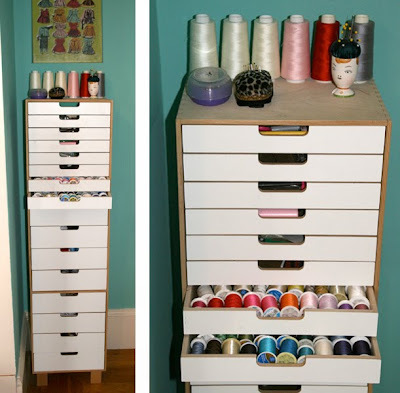 Take a peek into my crafty storage solutions on Craftzine's blog entry today! 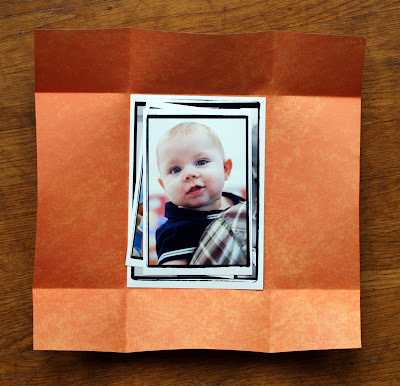 Photo mailers are functional, yet so dull, especially when sending pics for a special occasion. In an effort to create a protective barrier that also looks great, I came up with this simple & quick solution. I am a sucker for thicker-weight scrapbooking paper. The only problem is, I don't scrapbook so I'm stuck with large pads of beautiful paper. 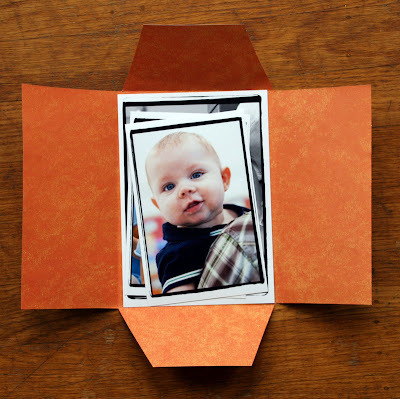 To mail 5x7" pics, I used 12x12" sheets. Place the photos in the middle of the sheet and fold around all 4 sides. Don't get too technical, just eyeball it. Next, cut the sides as shown using the fold lines as a guide. Fold the sides in first, then the top and bottom tabs. Punch holes in the top and bottom tabs, thread ribbon through and tie. You can add a custom tag to the thread as well. 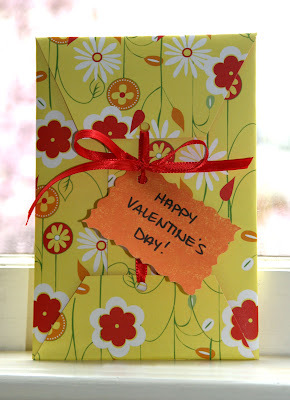 I used the paper scraps and cut the edges with decorative shears. Now you're ready to put the finished piece in a mailing envelope and send! 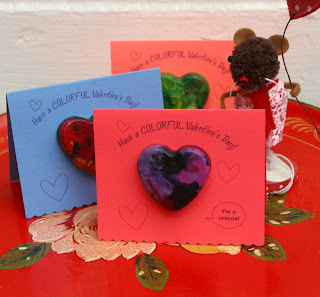 I wanted to come up with a way to create a Valentine accessory that wasn't your typical brooch, bracelet or earring. I started with a red headband and added the pink rick-rack for the foundation. Next I designed the bird silhouette and wing pieces and cut them out of wool felt. I love the idea of incorporating the heart shape between the two open wings. I joined both sides with the pink contrasting embroidery floss. Once the bird was slightly stuffed and ready to attach to the base, I decided it needed more texture and another element to frame it. I cut some additional felt in feather-like shapes and also attached it with the pink floss. 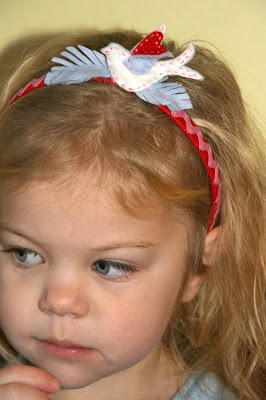 Download the pattern to make your own Lovebird Headband! Valentine's Day is just around the corner and I can already feel my sweet tooth calling. I wanted to find a craft that was cheap, unique, fun and something my preschooler could help out with. 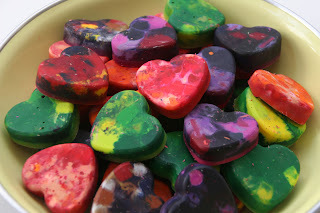 Craftzine.com recently featured an article on molded crayon hearts and immediately I knew this was the very project I was looking for. One rainy Saturday we took a trip to S.C.R.A.P. and loaded up a bag full of broken, misfit crayons. The challenging part was stripping all of the paper off the crayons. I still have multi-colored remnants beneath my nails. Target was selling the mini heart silicone muffin pans (which get pretty wrecked after this craft, I must say). We spent quite some time sorting the crayon bits by color, then chopping them into pea-size bits and filling the muffin pan. It took 15 minutes per batch at an oven temp of 275°F. DON'T try to transport the pan before the melted crayon is set. I spent another afternoon tediously scraping dripped red crayon off the linoleum floor. Oops! The colored cardstock paper was also found at S.C.R.A.P. ($3.00 for the bag 'o crayons and a thick stack of cardstock!). I designed the type and graphics in Illustrator and then ran the cards through my home printer. 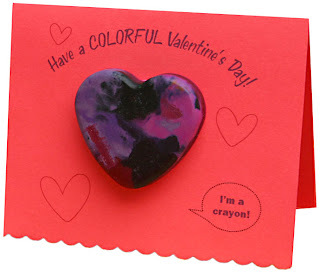 Note the "I'm a crayon!" detail. Didn't want her classmates to think they were getting a swirly, tasty treat and take a little bite. The bottom edge was cut with scallop-edge scissors for the finishing touch.